Heat oven to 475 F. Sprinkle flour on a clean smooth surface and stretch dough using your hand or rolling pin to flatten each ball to 1/2-inch thick circle. Transfer dough to spray-coated or cornmeal-dusted 12-inch pizza pans. Continue stretching, making a slight lip at edges to fit pans. Pizza will be thin. Blend garlic, rosemary, honey, and olive oil; brush over dough. Sprinkle crustes with grated cheese. Score crusts lightly into slices. Bake at 475 F about 8 to 10 minutes, just until crust is browned and crisp. In small bowl, mix together vinegar, olive oil, mustard, and honey for dressing. 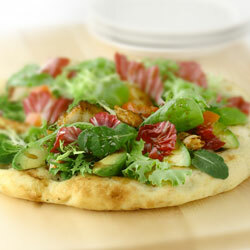 In large bowl, combine arugula, greens, radicchio, avacado or olives, and tomatoes. Pour dressing over salad; toss to coat. Portion half of salad onto each crust. Top each salad with half the shaved cheese and chicken or shrimp, if desired. Serve immediately. This entry was posted in cook, hot, italy, radicchio by admin.royalrose. Bookmark the permalink.